Coningsby's Lee Marshall makes a break for it during the derby game with Billinghay on Saturday. Photo: Oscarpix Imaging. 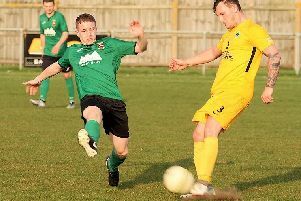 It was local derby time on Saturday when Coningsby FC took to the Allan Barker Field to greet Billinghay in a Boston League fixture. The Reds soon proved they meant business when, after just five minutes’ play, a pass from Sam Brader was put in the Billinghay net by Jason Cook. The visitors rallied briefly, but their strike was saved by a top form Coningsby goalie. With a quarter of an hour on the clock, the Reds’ Sean Boothby booted home a long shot from the right wing and Andy Kelly scored from the edge of the penalty area 20 minutes later to make it 3-0 going into the break. In the second half, Sean Boothby scored three more super goals, with Brader clinically administering the coup de grâce just before the final whistle.